Use the videos below to help your child master 5th grade science concepts. .
S5E1 Students will identify surface features of the Earth caused by constructive and destructive processes. Erosion is destructive process, which generally happens as a result of water (rain, rivers or oceans) and wind. Erosion is the 2nd part of a cycle. First the earth is worn down through weathering. Then the weathered material erodes as a result of water and wind. Finally, the material that has eroded stops somewhere else in what is known as deposition. What's the Difference between Weathering and Erosion? ​The Tallulah Gorge is a gorge that is formed by the Tallulah River cutting through the Tallulah Dome rock formation. The gorge is approximately 2 miles (3 km) long and features rocky cliffs up to 1,000 feet (300 m) high. Believe it or not people and animals are constantly erodingthe earth around them. Often times it is just a little bit of dirt sliding off a walking path but other times it can lead to massive problems. 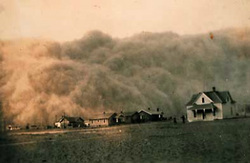 During the Great Depression in the 1930'spoor farming techniques helped cause what was known as the Dustbowl.